Le Cirque, on the Upper East Side, was the city's go-to power spot for 40 years. Then the real estate market took off elsewhere. One evening in May 2002, guests in evening dress crowded into Le Cirque 2000’s red dining room in midtown Manhattan's Palace Hotel. The unofficial VIP space in the storied restaurant’s second New York location featured a lurid explosion of heavy silk brocade, red-and-gold banquettes, and fawning waiters carrying silver-covered trays. Guests that night included chief executive officers and a smattering of A-list celebrities. Ivana Trump and her then-boyfriend Roffredo Gaetani sat at in the center of the room; a few tables over was Jocelyn Wildenstein, the billionaire-ex wife of art dealership scion Alec Wildenstein, dining with an impishly younger male companion. Soon, Donald Trump and his then-girlfriend Melania entered the restaurant, and guests—many of them halfway through the restaurant’s signature pasta primavera—paused to see how an interaction between long-divorced Donald and Ivana would play out. The two managed to scrupulously ignore each other until, an hour later, when Trump paid the bill and got up. He blew Ivana a kiss, and walked out of the room. It was just another night at the most prestigious restaurant in New York. Fifteen years later, the restaurant, now in its third location, has suffered a series of indignities: Demoted to a single star by the New York Times, it explored offering early bird specials as it struggled to meet its bills. Often, during the power lunch hours, most of its tables remain empty. On Tuesday, it was announced that the restaurant has filed for bankruptcy. Co-owner Mauro Maccioni is adamant that his family is not closing Le Cirque but admits that if finances were better, there would be no bankruptcy. "Fine dining is not what it used to be, especially when you have a 150-seat restaurant," he said over the phone. "The recent changes to labor laws, and changes to the industry can put you behind the eight ball and we did not modify our operation fast enough." The downfall of Le Cirque can be chalked up to many things—unsustainably high operating costs, changing restaurant trends, increasingly lackluster cuisine— but its rise and fall also track, with an almost uncanny accuracy, the shifts of New York’s real estate market. At its height, Le Cirque was at the center of New York society when the latter revolved around the Upper East Side. When the restaurant first opened in the Mayfair hotel on 65th Street in 1974, the city’s real estate was in the midst of a prolonged slump: Neighborhoods in Brooklyn, Queens, and the Bronx were suffering double-digit declines in housing prices; Manhattan, in contrast, was experiencing a 29 percent increase in home prices, according to a 2016 report (PDF) by the NYU Furman Center for Real Estate and Urban Policy. By 1997, when Le Cirque moved from 65th Street to the Palace Hotel just below 51st Street, the city had begun to change. “In the old days, it was considered absolutely déclassé to live in a condominium,” said Donna Olshan, founder of Olshan Realty and publisher of the weekly Olshan Luxury Report. Suddenly, condos began to look appealing. “These new things being built were really beautiful from an architectural standpoint, and they had all of these amenities and infrastructure,” she said. That meant looking outside of the Upper East Side neighborhood, for the most part. The reverse is also true: Restaurants, said the luxury real estate broker Dolly Lenz, are often used to draw wealthy residents away from their traditional habitats on the Upper East Side. "Now we have the rivers, whether it’s the Hudson Yards or the solo developments. It’s all about the rivers and other areas that weren’t popular. New York is moving, and restaurants are a huge allure to get you to move," she said. "That hasn't changed. Where Le Cirque is, it's kind of midtown, kind of the Upper East Side." That area is many things to many people, she explains, "but it's no longer the cool place to be." Even as some regulars continued to swear by Le Cirque, it closed its doors at the Palace Hotel due to labor disputes in 2004 and moved in 2006 to its current location on East 58th Street in One Beacon Court, where Bloomberg LP is also located. A few years later, Wells, the restaurant critic, visited the restaurant and had a less-than-happy experience. With so many high-end competitors, Wells said in the Times, it was hard to justify a meal at the restaurant. “These are not the best of times at Le Cirque, and I could never square what I’d eaten with what I’d been asked to pay for it," he wrote in 2012. The restaurant and its cooking were out of touch. Today, the few tables occupied during lunch at Le Cirque are filled with a certain kind of diner, people you cannot imagine stepping below 42nd Street, let alone knowing the best restaurant in the East Village. 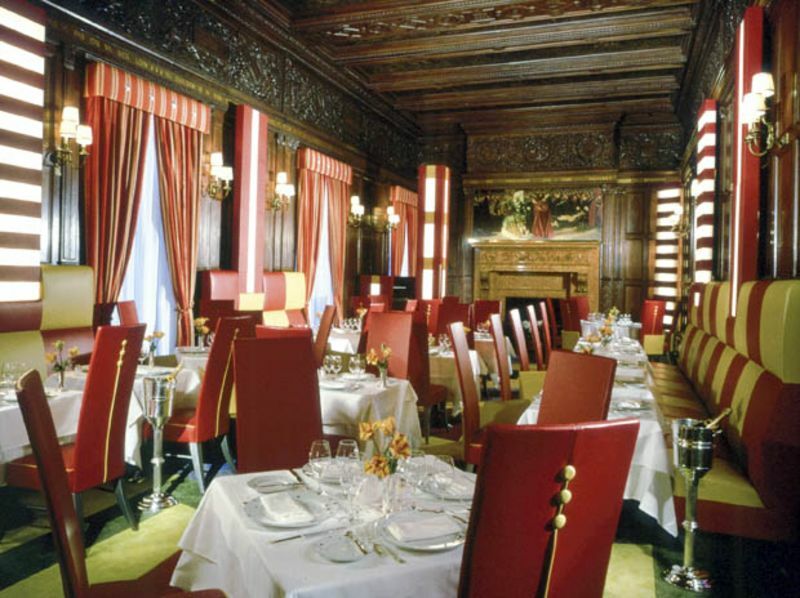 On a recent weekday, private equity manager Stephen Schwarzman was having a business lunch; just four other tables in the cavernous room had customers willing to pay for such dishes as the restaurant's famous Dover sole ($80) or lobster tagliatelle ($34). "Not only has the East Side changed as a bastion of wealth and whatever, but food trends have changed too," said Lenz. "The wealthy don't always want to eat something that looks like it came from St. Petersburg." Despite the fact that the city’s power center has shifted, the Upper East Side remains a wildly expensive neighborhood, and midtown still offers $400 power lunches. Restaurants, including the 21 Club and Jean-Georges, are in demand, and soon the Grill will open in the former Four Seasons space in Le Cirque's sphere. In addition, a stretch of midtown Manhattan known as “Billionaire’s Row” hosts a string of the city's most expensive apartments; a unit reportedly just sold at 432 Park Avenue for $44.25 million, and several additional towers, all with multimillion-dollar views, are under construction. As the Upper East Side experiences a renaissance of sorts, it stands to reason that Le Cirque might benefit. Olshan, the broker, said she thinks the 2nd Avenue subway will revitalize the neighborhood, but agrees that taste—and habits—have changed. “Who ever dreamed when I went into business in 1980 that the Upper East Side would be at the bottom of the pile?” she said. “I didn't think it would happen, or that it would be considered stodgy. But a lot of things follow—the restaurant business, for one thing." Mauro Maccioni, for his part, is resolute that Le Cirque's run is not over. A chef with a well known name will soon be announced, he says, and he well knows how cyclical tastes can be. Thinking back to his most famous guests during the restaurant's heydey, he laughed. "By declaring bankruptcy, maybe it makes it easier for me to be president some day."